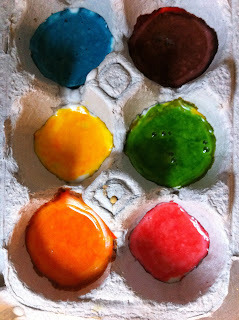 I love watercolor paints especially for kids. They are easy to use, easy to clean up and there are so many fun things you can do with them. We actually most often use liquid watercolors at home, I think they are just easier, no having to worry about a cup of water to knock over. However there is something about a palette of watercolor paints that is so appealing. So when I saw this recipe from Martha Stewart, using ingredients from our pantry I had to try it! 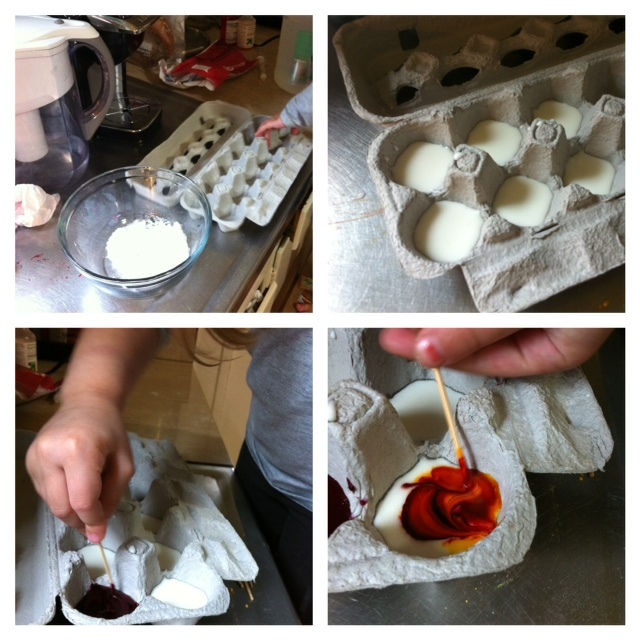 We started by mixing 4 tablespoons of baking soda and 2 tablespoons of vinegar into a bowl. The vinegar causes the baking soda to start bubbling and fizzing (think that volcano science experiment) which The Bee loved. Once it had stopped fizzing we added 1/2 teaspoon of corn syrup and 2 tablespoons of cornstarch. The Bee then mixed all the ingredients together while I grabbed an empty egg carton. We spooned a little of the mixture into each of the wells in the egg carton. The mixture sets up pretty quick so you kind of want to work fast here. Once all the wells were filled we added some food coloring to each. The Bee and I then mixed the colors in with a toothpick. By the time we got to the last of the wells the mixture was already starting to harden. We left the paints to set up for a while and then came back to give them a try. I have to say right here I would not call these watercolors. I have a very clear idea in my mind of what watercolors are, they are transparent and smooth, blending easily. These paints do not fit that description. They are however super cool, they have a chalky quality that reminds me more of pastels then paints. You do, however, use them just like watercolors, which I am guessing is why they got that title. We had to dip our brushes in water a few times to get them going because they have a little chalky layer on top, but once we got them started they were very easy to use. I highly recommend making and using these paints, they are really great, but if you are looking for real watercolors, you might want to try something else. Thanks for the info, can't wait to give it a try. Just a note on 'real' watercolours - I think water colour paints are traditionally opaque and chalky (that's why water colour paintings have that dreamy soft quality?). Here in Australia all watercolour paints are like this.